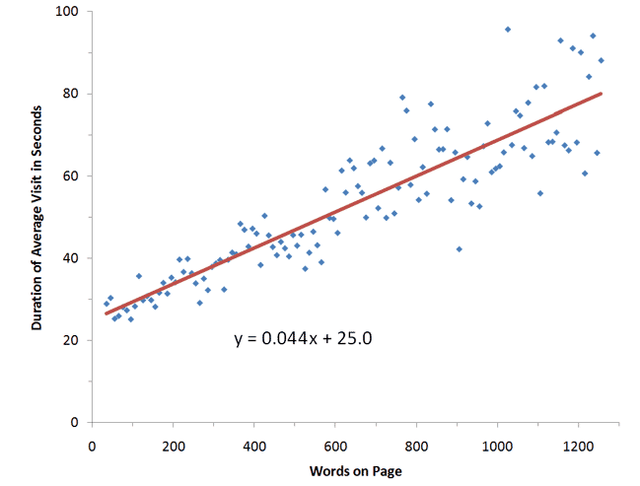 only 4.4 seconds on a page for each additional 100 words added to the page. 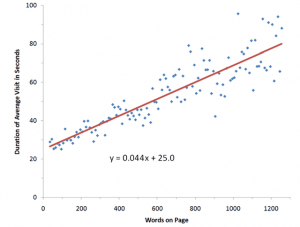 If we assume people can read at 200 WPM, the big finding is that for every 100 words you add to a page, you can assume that customers will read 18% of it. Choose words well, be concise…and I better stop writing to make the point! Or use this blog entry to make the point. I know this to be very true. Where my competitors spend a great amount of time writing about their products, I’ve decided to provide more pictures with more clarity. I better not let this information out, so we’ll just keep this between us and the whole wide world. It’s true how people would rather view pictures than read lenghty text. Sometimes a sentence or two is all you need to get your point across. People appreciate a direct and straight to the point ads..no more beating around the bush. All the more reason to use images, charts and graphs affectivly. Strangely, in much of my direct mail testing that requires a purchase off the page, longer letters and copy almost always beats short copy. And I have seen research that shows comparable research on the Internet. Longer direct response TV promotions invariably outperform the less expensive 30 second spots. 90 seconds do far better. And 120s even better if could buy the time in the longer increments. For awareness or positioning advertising, short is probably better. But for behavior change that requires writing out a check or giving a credit card number, don’t assume that short is better. Give the whole story answering any objections in well written copy and make sure the design makes skimming easier. The net of it is that longer usually outperforms short copy in the direct response world.